Every year it’s such a challenge to get “Bluebonnet pictures”! They are so beautiful, but it is always rainy this time of year which makes the ground so soft and muddy! The only place you usually see them is on the highway/interstate, unless you make an intentional country drive for pictures! It’s driving on the highway that reminds me … I need to get pictures! This last week as we were driving home from our Saturday ritual of Rudy’s breakfast burritos and donuts, we found a place easy to pull off on the highway for pictures. You have to be careful where you stop … you don’t want to cause on-lookers to have an accident! The ground was so soft from the rain, there was some complaining over that and over the precious flowers we squished to get pictures, and we came home with some mud on our shoes, but I got pictures! It’s very windy, and I can’t help but laugh when I see my youngest daughter’s hair blowing up against the back of her head … but, I got pictures! See … with Bluebonnets … you only have about two weeks to accomplish this amazing feat! BEAUTIFUL GIRLS!!! 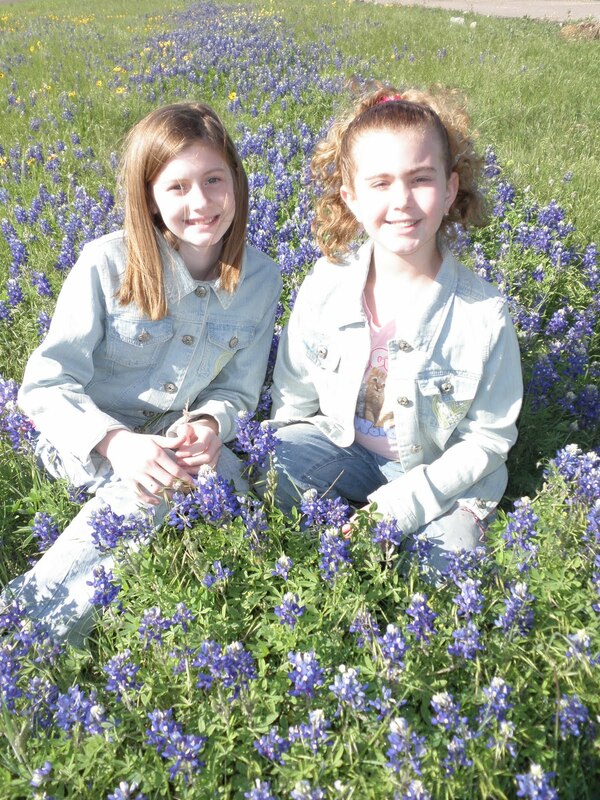 The bluebonnets were probably tickled pink to get to take pics with such pretty ladies!! Give the girls a big hug from all of us. We miss you guys so much!! We miss you, too, Lucrecia! I love the thought of Bluebonnets tickled pink!! I love you!